BLAIRSDEN, site for Mansion In May 2014 from Mansion In May on Vimeo. 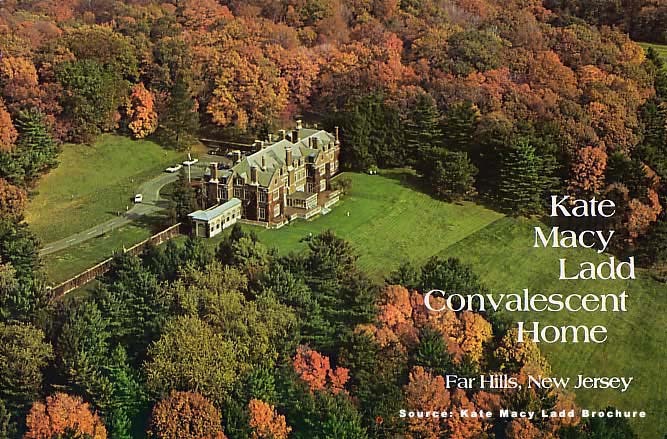 Out of all of the requests that we receive at Mr. Local History, none measure up to the sheer volume we receive every month requesting additional information on Blairsden, one of the crown jewel estates of the Somerset Hills. While there have been numerous pieces posted on the internet regarding Blairsden that stretch the truth and invoke imaginations, we will try to put Blairsden into its historical perspective. 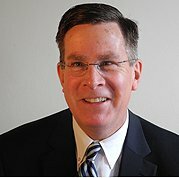 While stories of ghosts and ghouls are fun and often used as a draw to teach history, we hope that the pictures and articles from the local historical society’s research archives offer enough to quench your thirst for knowledge about this wondrous estate and how blessed our area is to have such a place. 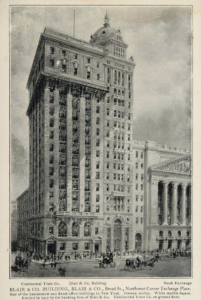 Clinton Ledyard Blair, in conjunction with his Grandfather John Insley Blair, and Father, founded the investment banking firm Blair & Company, building their Blair & Co. building on 24 Broad Street (on the Northwest corner of Exchange Place/Broad Street) in New York City. He was also governor of the New York Stock Exchange, a director of Lackawanna Steel, the Green Bay & Western Railroad, and many other corporations. Blair was both Commodore and Vice Commodore of the prestigious New York Yacht Club. He married Florence Osborne Jennings, and together they had four daughters: Marjory Bruce, Florence Ledyard, Edith Dodd, and Marie Louise. 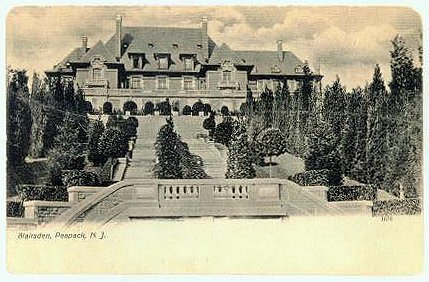 In 1898, workers began construction on CLB’s opulent 38-room, Louis XIII style mansion in Peapack-Gladstone, New Jersey. 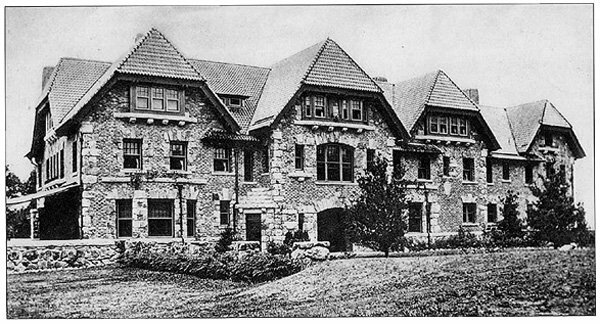 Blairsden, as he named the home, was finally finished in 1903. In February 1949, CLB died at the age of 82. The following year Blairsden and 50 acres of property were sold for an estimated $65,000 to the Sisters of St. John the Baptist. In the 1990’s when the Sisters of St. John the Baptist decided to sell “Blairsden,” a group of architects, landscape architects, architectural historians, and others formed the not-for-profit Blairsden Association with the intention of raising the funds necessary to acquire and restore the property and make it accessible to the public. Although more than $4 million in public and private funds were pledged to the Blairsden Association for the project, the Sisters, in 2002, decided to sell the property to another entity, the Foundation for Classical Architecture, which has since been carefully restoring the house and grounds. The Blairsden Association, although not successful in its efforts to acquire “Blairsden,” had nevertheless developed what was considered by many to be an effective model for a public-private partnership for such a project. As a result, the Association — which was renamed the Natirar Association — was asked by the Somerset County Park Commission to assist in the county government’s ultimately successful efforts to acquire “Blairsden’s” neighboring estate, “Natirar.” The Association was later dissolved. The Blairsden Estate is under current heavy restoration, and the owners are very private. The owners hope that everyone respects their privacy. THSSH will continue to follow up on its progress and hope that this historic estate is fully restored and shines once again. “Perhaps the most unique feature of Blairsden is the driveway entrance at the end of the two and a half story brick and stone structure, covering a very considerable space. and equipped with every modern convenience and luxury. This driveway entrance is in the shape of a parallelogram several hundred feet in length by two hundred in width. In the censure of the driveway is a deep lagoon or canal perhaps twenty five feet wide, bordered with a low stone coping, and on this coping are huge stone vases which yesterday were filled with goldenrod, and some with purple asters. 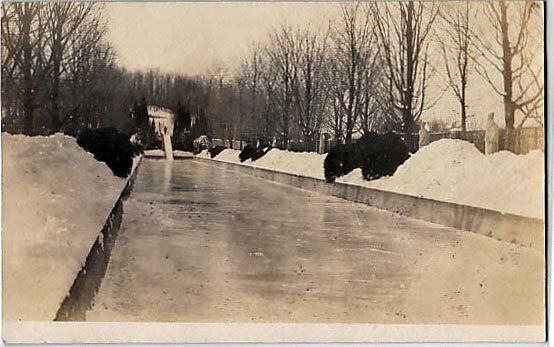 Between this canal on which snow white swans swam, is close clipped green turf with box trees with their ball like tops and also maple trees next the roadway on either side. The view from the drawing room library and other rooms among the terraced front out over the Somerset Hills and down the Peapack valley is beautiful. Blair actually flattened the highest point of his property to build Blairsden. Carrere and Hastings were the architect of Blairsden. The firm also designed the New York Public Library, the United States House and Senate Offices (“Carrere & Hastings Architects,” by Mark Alan Hewitt, Kate Lemos, William Morrison, and Charles D. Warren (New York: Acanthus Press, 2006). 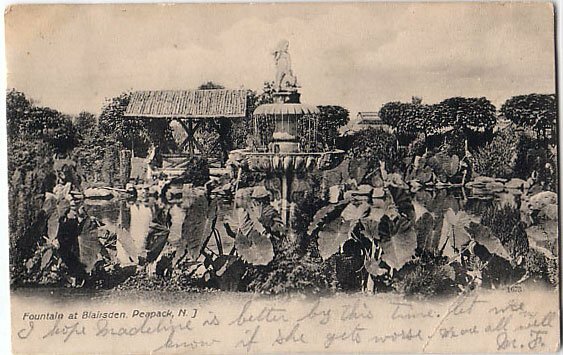 Blairsden’s front reflecting pool was approximately 300 feet long and was the home to two notable swans, Elsa and Lohengrin. Busts of twelve Roman Caesars lined the driveway entrance. A funicular railway was constructed up the steep incline behind the house, complete with its own engine, to bring materials up the mountain. Blairsden had electrical service,elevators, a steel structure, concrete floors, and the latest heating and cooling technologies. It was noted that every Thursday, a “Clock Man” would come all the way from New York, just to wind all of the clocks in the Blair house. 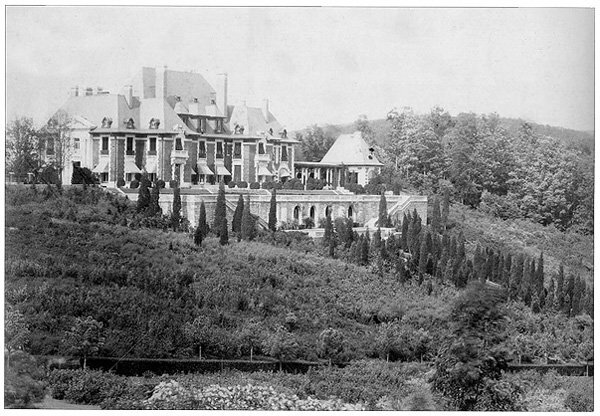 The landscape architect was James Leal Greenleaf, who along with the Olmstead Brothers firm, worked at the James B. Duke estate in Hillsborough, Percy Pynes’ “Upton Pyne” (Bernardsville), Clarence Mitchell’s “Pennbrook” estate (Far Hills), and the Mendham estate of Waltes P Bliss, “Wendover”. Greenleaf, as a member of the National Commission on Fine Arts, also worked on the design of the Lincoln Memorial landscape in Washington DC. Over 1,400 types of roses were said to be planted in the rose garden. 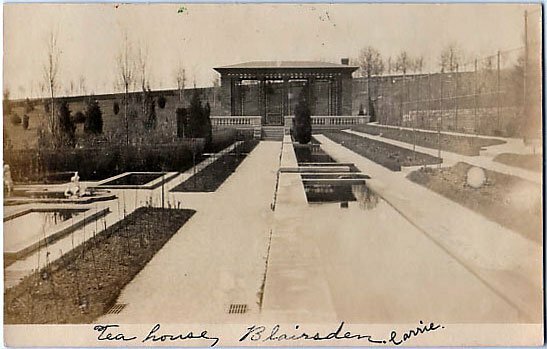 Blairsden held many attractions for the athletic set: Tennis courts, a boathouse, a squash court (basement), horse trails, a horse track, and trap shooting range with its own lodge, an indoor Turkish Bath/pool in the basement aka “The Plunge” (basement) were on the estate. More than 75 full grown trees with 20″ trunks and up to 60 feet tall were moved by 16-horse teams up the hill to the estate. Members of the extended Blair family became major clients of the Carrere & Hastings architecture firm. In addition to “Blairsden,” Blair-related commissions by Carrere & Hastings included (a) the New York City town house of C. Ledyard Blair on Fifth Avenue at 70th Street (since demolished, it was located across 70th Street from the Carrere & Hastings-designed house, now museum, of Henry Clay Frick), (b) a garden and towered boathouse at Ledyard Blair’s Bermuda estate, “Deepdene” (extant), (c) alterations to Ledyard Blair’s stable and artist’s studio at 123 East 63rd Street in New York (extant), (d) the James A. Blair country estate, “Ontare,” in Oyster Bay Cove, New York (extant), (e) the J. Insley Blair estate in Tuxedo, New York (extant), (f) the Blair & Company office building at the northwest corner at 24 Broad Street and Exchange Place in downtown New York (demolished), (g) the house of Mrs. Arthur Scribner (Ledyard’s sister) in Mt. Kisco, New York, and (h) “Vernon Court,” the Newport, Rhode Island, estate of Mrs. Richard Gambrill, whose son, Richard Van Nest Gambrill, married Ledyard Blair’s daughter, Edith. The main entrance driveway off what is now Lake Road was over a mile long, and was built just below Ravine Lake Dam, and proceeded up the hillside wrapping around the rear of the house, eventually bringing you up the side of the estate, eventually putting you in front of the 300 foot reflecting pool, thus providing a scenic tour of the estate before you reached the entrance. There were approximately 38 rooms when Blairsden was competed. The main entrance doors were made of bronze with 1 inch thick plate glass windows each weighing more than 1,000 pounds. There were 25 fireplaces each with a uniquely designed mantel. 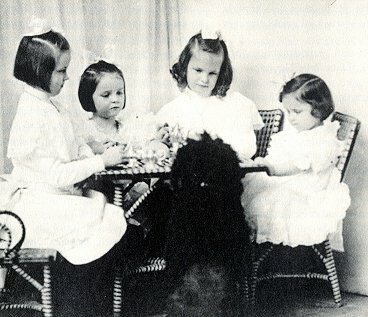 All four daughters of the Blair’s celebrated their wedding receptions at Blairsden (Marjory, Florence, Edith, and Marie). 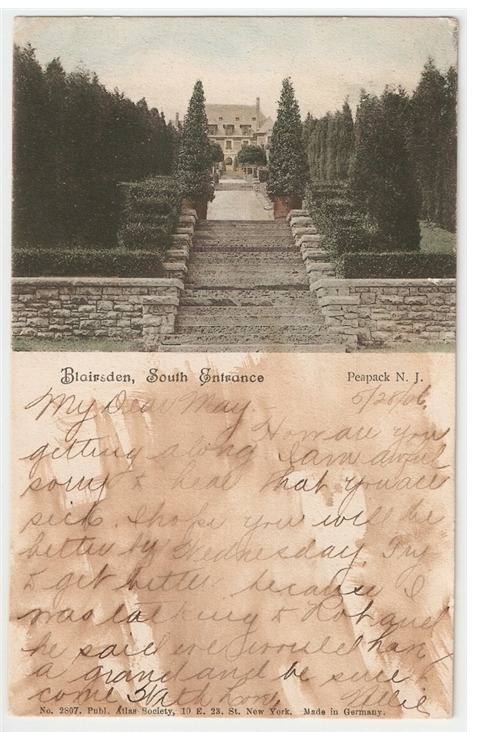 The original main entrance gate was at the base of Ravine Lake, not the one that can be seen today off Peapack Road in Peapack. Blairstown (formerly Gravel Hill), New Jersey and the Blair Academy that he endowed, were named after Ledyard’s grandfather John Insley Blair. The Matheny School now occupies what was the Blairsden coach barn and stables. A great majority of the Italian stonecutters remained in Peapack after the initial railroad project to Peapack was completed, worked on the Blairsden project, and remained in the area. The coach barn and stables were built by P. Vanderhoof and sons of Newark, for $30,000. The barn actually had an elevator in it going up to the second floor. Several carriages and sleighs were donated to the carriage museum at Shelburne Village and Museum in Burlington, Vermont. There is also a Blair carriage at the Staten Island Historical Society, New York, in the Historic Richmond District. 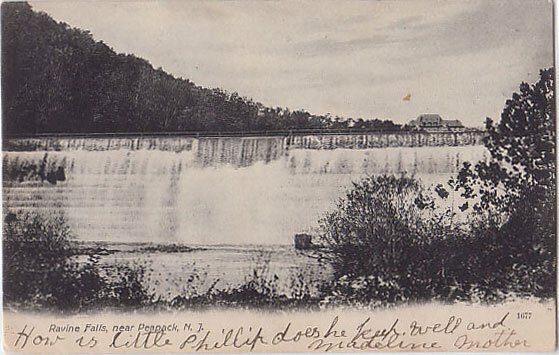 Ravine Lake Dam – Designed by Frank Stone Tainter during 1898-1899 on the North Branch of the Raritan River – for what was then known as the Ravine Association. Many people still call the lake Blairs Lake, but it was never officially called that. Rumor has it that the first brick was laid the day C. Ledyard’s daughter was born. 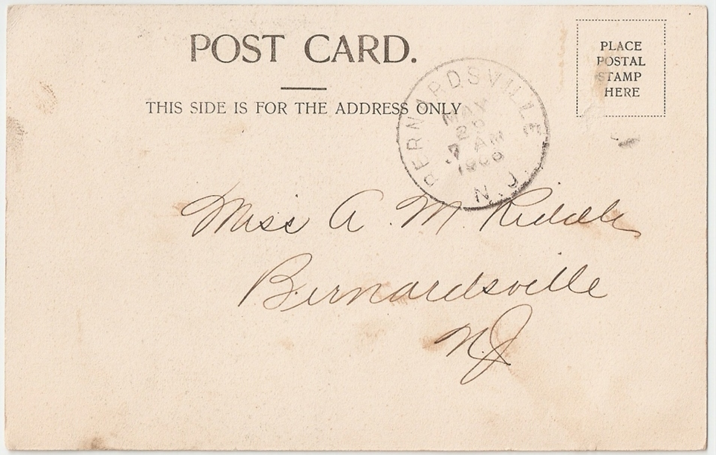 (October 1, 1898- Marjory). The last stone was laid on his other daughters Birthday in 1899 and Marie was nicknamed the “dam baby”. 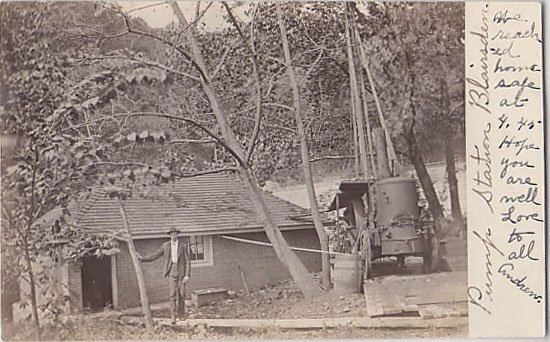 The Blairsden water pumping station, located at the Southeastern edge of the estate down along the edge of Ravine Lake. The pumping station was responsible not only for water for the estate, but for the many fountains and waterfalls and landscaped pools throughout the property. The actual pump in the station operational today. Cross hall looking from main entrance. The bronze statue in the center of the room is of Joan D’Arc. Ariel View of Kate Macy Ladd Convalescent Home, know also as Natirar. 1867 – Clinton Ledyard Blair born in July. 1869 – Wife Florence born. 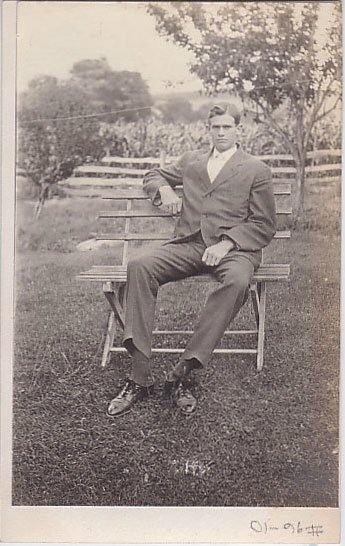 1890 – Clinton Ledyard Blair graduates from Princeton University. 1890 – Clinton Ledyard Blair forms the investment firm Blair and Company with his father DeWitt Clinton Blair, his grandfather John Insley Blair, and his brother James Insley Blair at 1 Wall Street, NYC. 1899 – On 2 December 1899, Clinton’s grandfather John Insley Blair died at home at the age of 97, owning assets said to be worth $70,000,000! 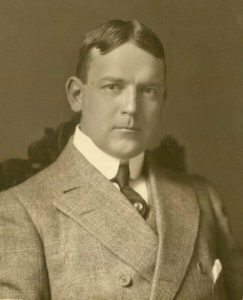 1909 – C. Ledyard Blair is Vice Commodore of the New York Yacht Club. 1910-1911: C. Ledyard Blair becomes the Commodore of the New York Yacht Club. His steam yacht, the Diana was one of the largest of the yachts of the NYYC (254 feet), and was the flagship of the club during his tenure as Commodore. 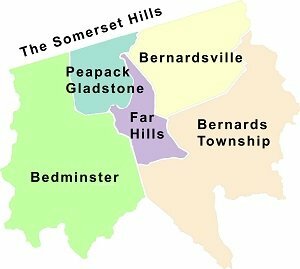 1912 – The borough of Peapack & Gladstone secede from Bedminster Township. 1913 – Daughter Marjory marries William Clark, and they have their wedding reception at Blairsden on September 20, 1913. Six hundred guests attend and special train was leased to transport guests from Hoboken. They commenced their honeymoon aboard the 250′ Blair steam yacht Diana. (NY Times). William Clark was a son of John William Clark, president of the Clark Thread Company of Newark, New Jersey, and Margaretta Cameron Clark, a daughter of United States Senator J. Donald Cameron. 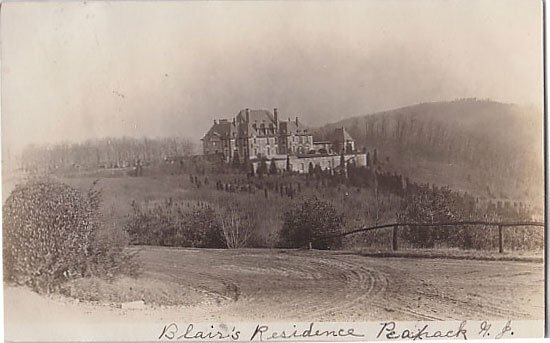 The Clark family estate, “Peachcroft,” was located on the Bernardsville mountain not far from “Blairsden.” William Clark, who received undergraduate and law degrees from Harvard University, briefly practiced law before becoming a judge. In 1925, at age 34, he was appointed to the United States District Court for the District of New Jersey by President Coolidge, and in 1938 was elevated to the United States Court of Appeals for the Third Circuit, in Philadelphia, by President Franklin D. Roosevelt. 1916 – C. Ledyard Blair chosen as Alternate delegate to Republican National Convention from New Jersey, in Chicago IL (resulted in the nomination of Charles Evans Hughs from NY and Charles Fairbanks of Indiana for VP) who lost to President Woodrow Wilson. There are numerous discussions in the Princeton Archives about a rift between Blair and Wilson. 1917 – Daughter Edith Blair marries Richard Van Nest Gambrill on June 21, 1917. 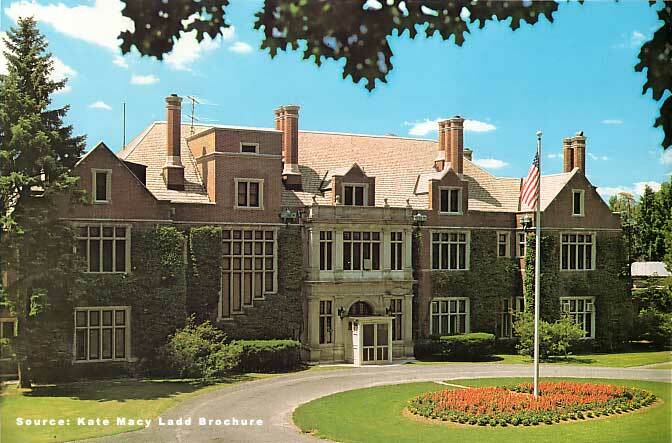 Richard Gambrill bought land in 1927 and became a neighbor to Blairsden building Vernon Manor. 1929 – In 1929 the bank Blair & Co. was acquired by Bancamerica Corporation to form Bancamerica-Blair Corporation (last trace 1943). On Thursday, October 24 1929, panic selling occurred as investors realized the stock boom had been an over inflated bubble. Margin investors were being decimated as every stock holder tried to liquidate, to no avail. Millionaire margin investors became bankrupt instantly, as the stock market crashed on October 28 th and 29 th. By November of 1929, the Dow sank from 400 to 145. In three days, the New York Stock Exchange erased over 5 billion dollars worth of share values! By the end of the 1929 stock market crash, 16 billion dollars had been shaved off stock capitalization. The impact to Blair and the entire Somerset Hills community was changed forever. 1931 – Florence Blair, wife to C. Ledyard dies in New York City after a long illness. 1949 – February – Clinton Ledyard Blair dies. at the age of 82. 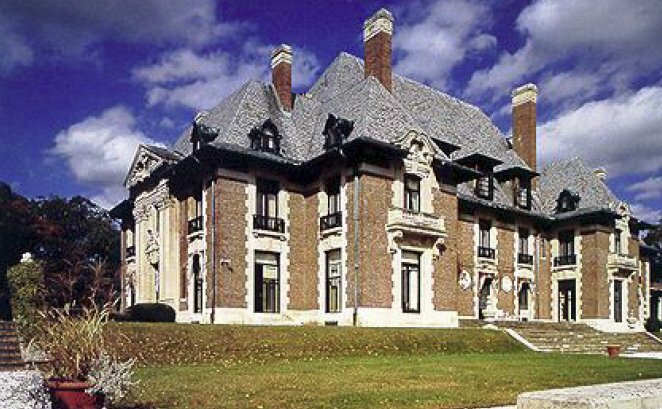 1950 – Sisters of St. John the Baptist buys the Beaux Arts manor Blairsden, built by Wall Street financier Clinton Ledyard Blair, in 1950 for $65,000. The contents were auctioned by Parke-Bernet Galleries Inc., 980 Madison Ave, NY. 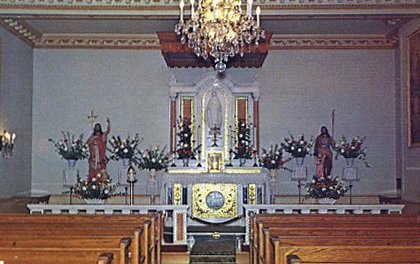 1950 – Sisters of St. John rename Blairsden to St. Josephs Vila and begin operating the facility as a religious retreat. In the 1990s when the Sisters of St. John the Baptist decided to sell “Blairsden,” a group of architects, landscape architects, architectural historians, and others formed the not-for-profit Blairsden Association with the intention of raising the funds necessary to acquire and restore the property and make it accessible to the public. 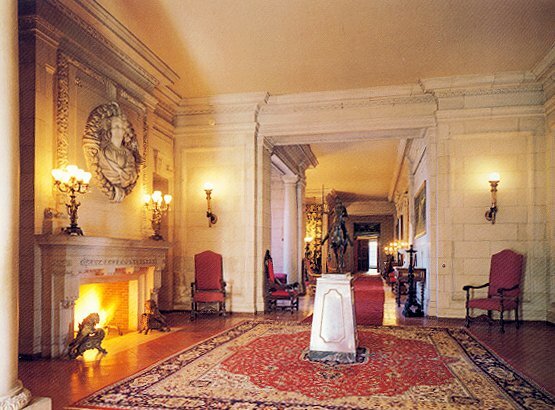 Although more than $4 million in public and private funds were pledged to the Blairsden Association for the project, the Sisters, in 2002, decided to sell the property to another entity, the Foundation for Classical Architecture, which has since been carefully restoring the house and grounds. Turpin Real Estate begins listing Blairsden for $6,000,000. The listing describes the estate including 30 acres. 2002 – Sisters of St. John the Baptist sell the Blairsden estate in Peapack-Gladstone for $4.5 million to an entity called The Foundation for Classical Architecture. “It was very painful letting go,” Sister Damiani said, noting they were filled with memories. Terms of the deal are undisclosed. 2003 – Blairsden reaches its Centennial birthday. 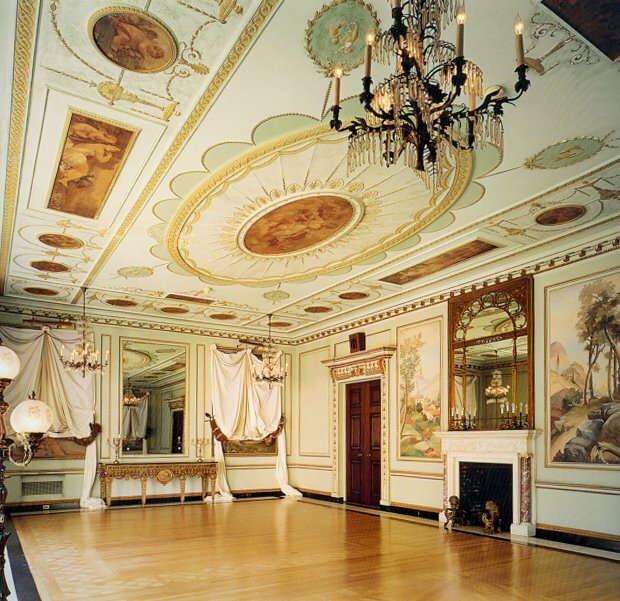 2002-2006: After the order of sisters that owned Blairsden decided to sell to the Foundation for Classical Architecture, the Blairsden Association ceased to be active. In relatively short order, however, after the Somerset County Park Commission asked the members of the Blairsden Association to advise and assist the county in its efforts to acquire the Natirar estate from the late king of Morocco, the organization was renamed the Natirar Association. After Natirar was acquired by the county, the Natirar Association was dissolved. 2007 – Blairsden, considered by many to be one of the finest examples of residential Beaux-Arts architecture in the United States, is now in private hands. It is being renovated in spectacular fashion with the guidance of its resident curator and under the auspices of The Foundation For Classical Architecture Inc.
2012 – Turpin Realtors lists the Blairsden estate for $4,900,000 – Size: 50,000 Sq. Ft. – Bedrooms: 31 – Bathrooms: 14 Full, 5 Half. The estate sold for $4.5 million to a holding company named Blairsden Hall, LLC. 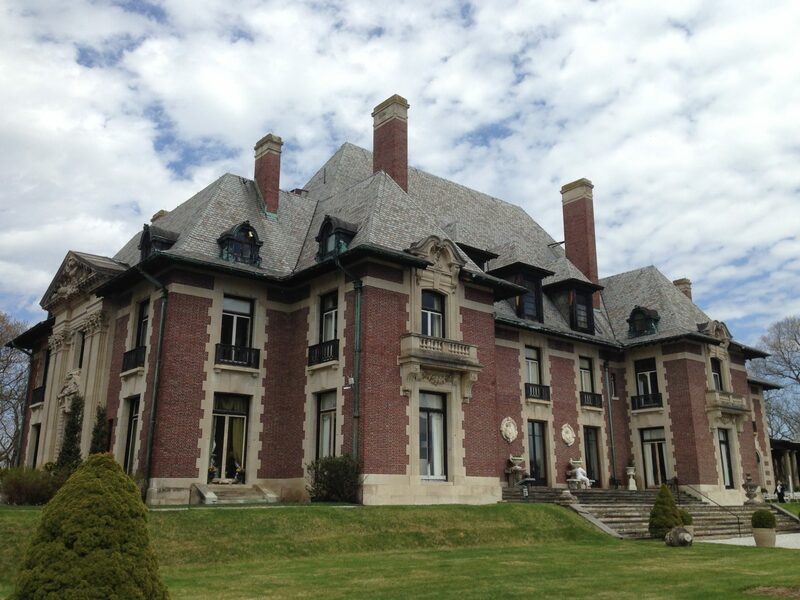 2014 – The owners who spent a huge amount of money restoring Blairsden allows the Mansion in May program a month long open house. 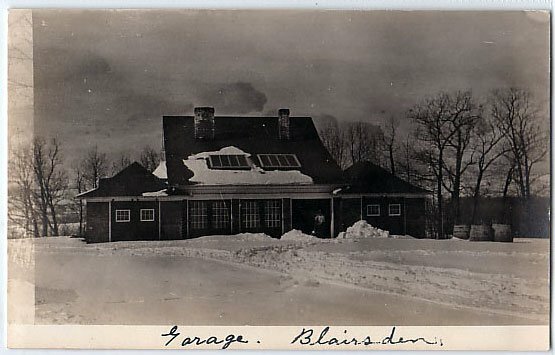 “Because Blairsden is private, it is closed to the public, except upon invitation,” according to William H. Horton, Mayor of Peapack/Gladstone. 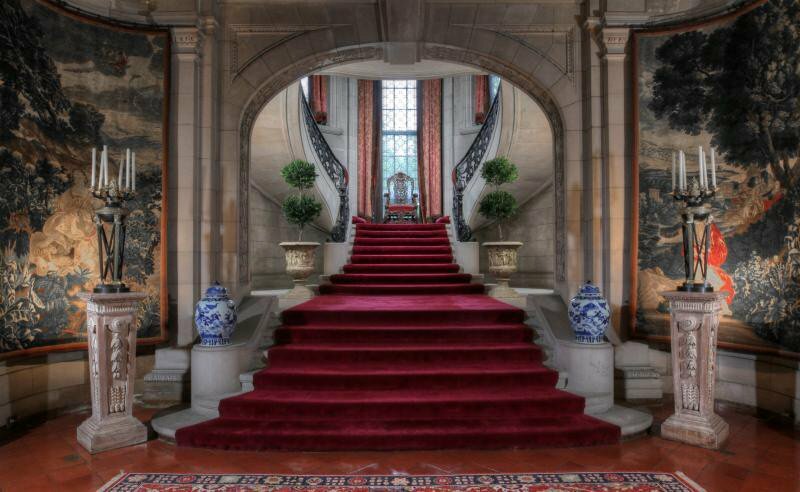 For thirty short days in May 2014 , one of the most iconic, historic, and private mansions in New Jersey was open to the public. Blairsden – The Carrere & Hastings designed beaux-arts mansion. 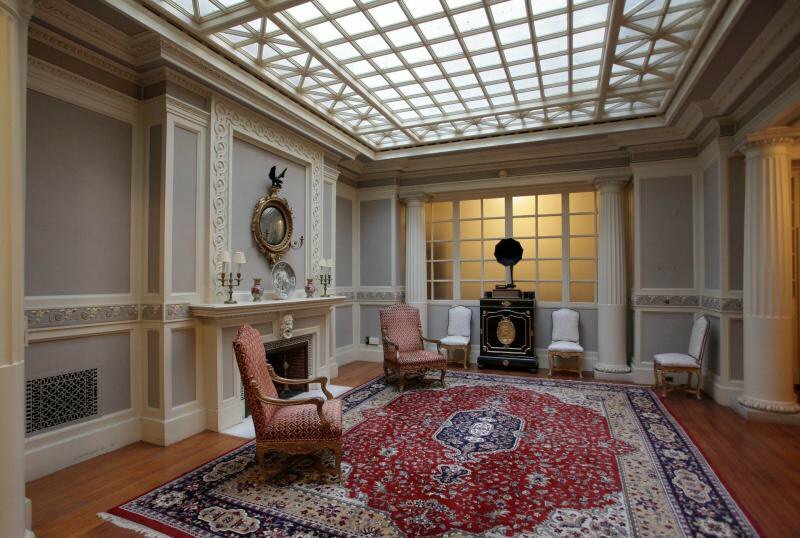 ts sumptuous interior of limestone, marble and rich woods reflects Blair’s lifestyle during the Gilded Age. Italianate gardens were created, extensive rose gardens added by the tennis courts, and a stone and brick staircase linked to a mosaic ramp that once led to Ravine Lake. Elegant weddings for his four daughters took place in this exquisite setting overlooking the countryside. Inside, the basement then held a pool, Turkish baths and a squash court. Expansive public rooms on the first floor opened to terraces or the veranda that joined the tea house, or Belvedere. To see the individual video tours – click the PLAYLIST button at the top left of the YouTube player below. 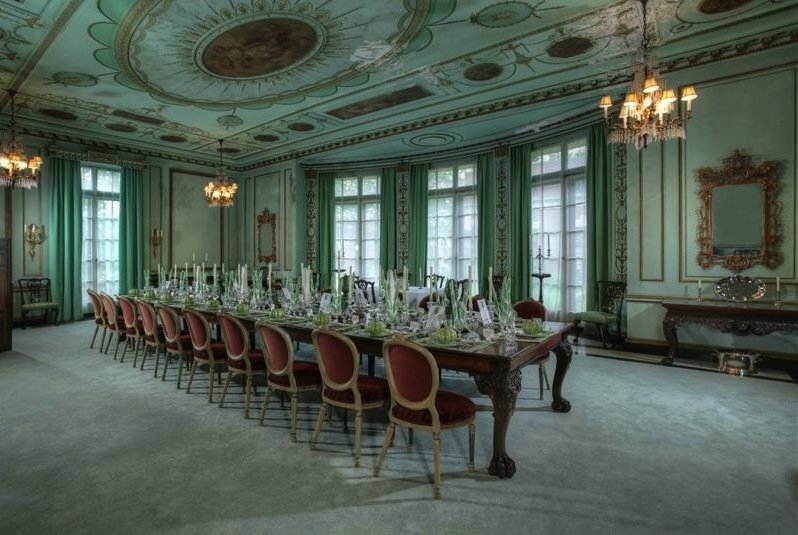 One of the most exciting open house events, the Mansion in May allows a glimpse into the grandeur of the gilded age at the turn of the 20th century. Take a step back in time as narrator W. Barry Thomson and Brooks Betz collaborate again to bring you the Blairsden History Series: The Estate Tour. Graciously narrated by W. Barry Thomson, a noted author and lecturer on the history of Blairsden. Barry also had the pleasure of being raised on part of the original Blairsden estate. Watch as you take 18 guided tours beginning at the top of the estate, past the reflecting pool and roman emperors, thru the estate, to the famed Belvedere. Over 45 minutes of narrated video in all! Up in Warren County New Jersey lies Blairsden, a town that had previously been known as Smith’s Mill and was later called Butts Bridge. Then in 1845, Blairstown was incorporated as a township by an act of the New Jersey Legislature on April 14, 1845, from portions of Knowlton Township, based on the results of a referendum held that day. The township was named for John Insley Blair, who was C. Ledyard Blair’s grandfather. Movie buffs would recognize Blairsden as scenes from the horror film Friday the 13th were filmed on Blairstown’s Main Street, and at the Blairstown Diner on Route 94; the Boy Scout camp No-Be-Bo-Sco in adjacent Hardwick Township was the site for Camp Crystal Lake. John Blair also founded the prestigious Blair Academy in Blairstown. 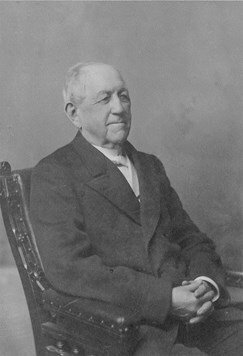 John I. Blair remained the School’s principal benefactor for a half-century, and his philanthropy facilitated Blair Academy’s early growth and even re-established the School when it would have otherwise foundered. Buildings including Insley Hall and Locke Hall were erected in the late 1800s, and Mr. Blair’s son, DeWitt Clinton Blair, funded campus expansion and improvements, including the construction of Clinton Hall, in the early 20th century. has won 10 overall National Team Championships. For the 2018-2019 academic year, Blair charges $62,000 for tuition, room and board. Day students are charged $43,400, which covers tuition, study rooms, and meals at school. Now it’s Your turn. If you have any of your own information to share, please feel free to post a comment or story.